Popular international exhibitions are shown along side the Museum’s outstanding collection of more than 17,000 works of American, Asian, European, Latin American, Western American, modern and contemporary art, and fashion design. Visitors can also enjoy PhxArtKids an interactive space for children, vibrant photography exhibitions through the Museum’s landmark partnership with the Center for Creative Photography, the lushly landscaped Sculpture Garden, dining at Palette and shopping at The Museum Store. 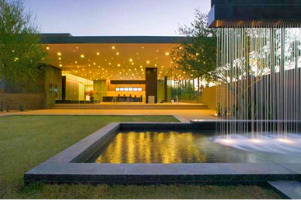 The Southwest’s premier destination for world-class visual arts. A vibrant destination for more than 50 years, Phoenix Art Museum presents festivals, live performances, independent art films and educational programs that enlighten, entertain and stimulate. Its unique setting is a wonderful choice to host an event such as a holiday party, business luncheon or a very special ceremony. Visitors also enjoy the interactive PhxArtKids gallery, vibrant photography exhibitions through the Museum’s landmark partnership with the Center for Creative Photography, the lushly landscaped Dorrance Sculpture Garden, dining at the Museum’s restaurant Palette, and shopping at The Museum Store.